Hello happy readers! I hope you all had a great weekend. I am way behind on some of my regular shows but I did get something new that I hope will work as intended and allow me to see more movies and let me start including new movie reviews in here as well. More on that once I've tried it out. Mostly this weekend I spent more time listening to my current audiobook to finish it, because it was hard to stop, than I did sleeping . 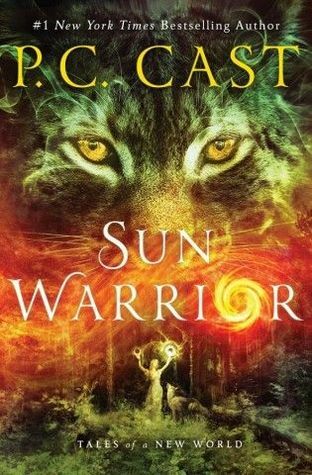 Today I'm going to discuss my thoughts and feels on the new release Sun Warrior (Tales of a New World #2) by P.C. Cast which is the amazing sequel to Moon Chosen which I reviewed here. I did receive an advanced digital ARC from NetGalley (thank you) but as I listened to book one and enjoyed the experience I waited to listen until I could get the audiobook on release day. So this book picks up exactly where the first one left off so spoilers for book one ahead. Things pick up right where we left off. Mari and Nik and their canines are fleeing in a boat from the angry Thaddeus and his followers who murdered Nik's father and blame Mari for that and the raging fire that fell down upon the tribe and is currently burning its way through the forest. They freed the slaved Earth Walker women and now much fight to save more people. The time for hiding is over, Mari is a moon woman, half companion, and fully herself. She will do whatever she can to help her clan but she will not hide who and what she is anymore and wants to make something new and better. Nik is right there with her in creating something new and while it won't be easy and they have many difficulties to face along the way as long as they believe in one another there is always hope. First and foremost I loved the characters. Each one was different and unique and I really enjoyed the different voices they had to offer the story. We saw things from many different sides, creating a larger whole. The Earth Walkers, the Tribe of the Trees, and the Skin Stealers. Each group only has a small bit of knowledge of the other never fully understanding or knowing them. They each have made assumptions on them with that limited knowledge and never bothered to learn more. It's hard to change ingrained ways. Its even harder to admit your ways were wrong. I love how related everything is. How coming together, like Mari and Nik, and sharing different experiences and information how similar they are. We get to spend time with way more companions as well which I adored because come on dogs and an amazing lynx what could go wrong there? I admit freely to growling while listening at times when something happened and it was felt by one of the animals, maybe it's the audiobook or maybe I'm strange but yep I growled. I'm going to go with being really into the story. Bast may be my favorite new addition. Getting to know the lynx was fun as her personality is very different than the pups we are used to but so is her dynamic with her companion. I can't say enough how much I enjoyed getting to see the different types of people in this world as it continues to grow. I'm especially excited to meet the next group that should be in the next book! The story and plot both keep things moving along as there is always something happening. I was invested in the characters both good and bad and seeing what would happen and how things would meet up or relate as it continued on. I my feelings for some shifted through the book on both sides, characters I didn't care for I started to enjoy and root for while some I did like started to lose their affection. I love how everything is fluid as with nature and personalities when confronted with new experiences. It's not a constant action packed extravaganza but that isn't the type of story it needed to be. There is a lot happening behind the scenes, plotting, planning, and emotional conflict, discoveries, and more to keep the story moving along as it grows. Plus as with everything I have read by Cast I love her humor. She finds a way to infuse some hilarious moments throughout. I would randomly find myself bursting out with a fit of laughter at some parts and then having to go back because I couldn't hear the next part I was too loud. "Hey, I'm muddling an enormous amount of poppy tea to drug a bunch of people. Partially to alleviate their pain and partially to shut them up." I really enjoyed this book. I even enjoyed it more than the first one as I was familiar with the world and I fell right back in. My only problem with having finished it within a week is that I don't know when the next book will come out and I am beyond excited to learn more. As with the first book we left off right at the end of a pretty HUGE thing that had us eager to find out what would happen next. We again leave with so much anticipation for more it's almost painful to have to sit and wait for the next installment, but wait I shall because I am hooked! As a side note as much as I loved the audiobook I also enjoyed following along with the end of chapter sketches in the physical/digital book too!